Hello to all my GSB Members. I hope everyone had great summer and I hope everyone enjoyed the Picnic on August 12th that we had at the Centennial Park. We had over two hundred and fifty attendees and the weather was perfect most of the day. We would like to thank our caterer Rangoli for great food and of course all our members who supported us and all our volunteers who did such an outstanding job. We also had arranged for a bus trip to ISKCON Vrindaban (Golden Temple), West Virginia and Sri Venkateswara Temple, Pittsburgh, Pennsylvania for August 18th & 19th. This trip would not have been possible without the tireless work of Nikhil Talati who did a tremendous job coordinating the whole trip. This trip was such an amazing trip that parents who came with us found it very touching and unforgettable. The response was awesome. So, please join us next year if you were unable to make it this year. We are excited to bring you our premier program "Grand Navratri Dandiya" again this year starting with 1st Saturday October 6 with Ujavall Vyas Group from New Jersey, 2nd Saturday October 13th by Swaraanjali Group, followed by 3rd Saturday October 20th by Arpan Group and fourth Saturday October 27 by Mayuri Patel Group (Raas Ramzat from India) at Meadowbrook Athletic Complex, Ellicott City.In addition, we will have great vendors. Please see elsewhere in the Newsletter for additional information. We are working diligently to bring you an excellent music program for this year’s Diwali Musical Program/Dinner evening live with Samir & Dipalee (India’s favorite singing couple) scheduled for November 11th at the Best Western Plus & Conference Center in Baltimore. This is a great venue and I hope everyone can join us. Please visit our website for updates and do provide your email address so we can keep you informed. 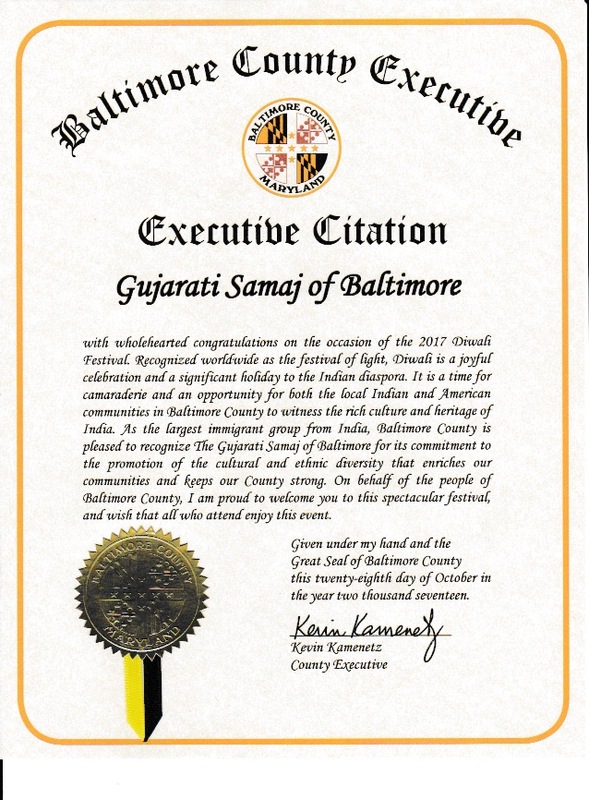 You can also go to our website http://www.gujaratisamajbaltimore.com and subscribe to have your name added to our mailing list. For advertisements, please contact Raj Patel and for event sponsorship you may contact any one of the Board members or send us an email at contact@gsbaltimore.org. We thank all our members from the bottom of our heart who have stepped forward to help us celebrate our past events. And, we cannot express enough our gratitude and appreciation to all our volunteers, committee members, their spouses and children, our sponsors and well-wishers. We humbly request you all to please continue to provide us your support and encouragement. Everyone has a purpose in life… a unique gift or special talent to give to others. And when we blend this unique talent with service to others, we experience the ecstasy and exultation of our own spirit, which is our ultimate goal of all goals.